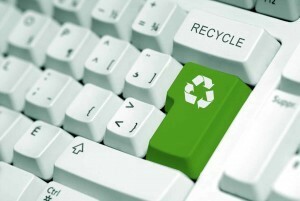 Electronics recycling can be a bit confusing as it is a relatively new issue we face. Just doing a quick search brings up a lot of results and most companies seem to be doing the same thing. So which one do you use? Since we have been open, we have received many questions about what we do and how we do it. Listed below are some of the questions we get the most. We do things a little different than most of our competitors and we hope you see why. Is there a cost to come out and pick up our material? There is no charge for our services. We cannot send a truck out for single items like printers, TV’s, phones, etc. We may not charge for our services, but there is a cost on our end. We have to set a minimum for a pickup at more than one item. Is there a cost to shredding hard drives? There is no charge. I have heard some companies charge up to $15 per drive. That’s ridiculous! We can come to you and shred them on site, or shred them at our warehouse at no charge. Do you offer certificates of destruction? Yes, we do. We can provide serialized certificates of destruction on or off-site. We also provide video documentation upon request. 100% of the hard drives we receive get shredded. Need asset tracking, we can do that too! Is my data safe when I drop off my material? Whether we pick your material up or if you drop it off, we follow a policy of total data destruction. While some companies offer some money for your material, they want to wipe your hard drive or sell it whole unprocessed for recycling or reuse, which may put your data at risk. They also charge a fee for other services or less desirable material. Wiping a hard drive does not offer you a tangible result that your data has been destroyed. We shred your drive, all of them in fact. If you want to hold it in your hand when we are finished, you can. Our methods of destruction exceed most data destruction standards and is a far superior option than having your drive wiped and/or reused. In essence, other companies are paying you for less secure data security or charging you for the same or lesser destructive process we offer at no charge. Can I drop off my material at your location? What happens to my material? The first thing we do it pull the hard drive for shredding if the items contain one. Most items are broken down to the core components after that. Some items are left in the condition we receive them and further processed downstream. Once we have enough material built up, we ship the processed items to a responsible/licesnsed downstream. Ultimately, most material will be refined and recovered to be reused again. We make money through the recycling process. Items like circuit boards have a metal value associated with them. The grade or type of board determines its value. Even after we shred the hard drives, the shredded metal has a value to it. Some circuit boards also contain chips that can be reused on new boards. Once we take the items apart and sort the material we then sell it downstream to another company that specializes in buying in bulk from businesses like ours. They, in turn, send the material off to be refined or certain components may go back into reuse. Why do other companies pay for computers? They pay because they refurbish them. In essence, you are selling your right to data security. Their idea of data security is wiping a drive in order to put a new operating system on it and reselling it. The problem with this is that you would never know if they handled your drive properly before they resell it. I have heard all types of stories about companies not wiping or destroying hard drives as they promise, it’s scary! Our hard drive shredding services offer a tangible means of drive destruction. Once your drive is shredded, you can hold it in your hands and feel confident your data will never be recovered. We also take the items most other companies don’t want like printers, monitors, keyboards and mice, and electronics gadgets at no charge. They generally do not pay for old gear, in fact, most of them will charge you for old electronics that have no refurbish value. They may even hit you with a fee for pick up. Some companies like to come out a cherry pick the items they want and leave you with the less desirable items. You may also be paying to support gimmicky certifications or business models. Companies that charge for items are inherently less responsible in their recycling process because once you pay for them to dispose of your material, they no longer have the incentive to find recycling value in it. These types of business are not an electronics recycling business.